Cybersecurity attacks and incidents in enterprises have shown a 45% increase during the first quarter of 2017, according to the National Security and Industry Incident Response Center (CERTSI), operated by the National Institute of Cybersecurity (INCIBE). In this way it is evident the need to raise and consolidate our levels of resistance against cyber attacks and cyber threats to strengthen the competitiveness of our businesses. 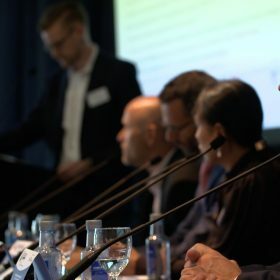 Pulse Conferences has organized the CISO 360 Congress in Barcelona under the motto “Connecting minds, securing the future”, focused on analyzing how to be a world class cybersecurity leader in the era of digital innovation. An event that has brought together leading cybersecurity agents and experts in an intimate gathering environment with the goal of understanding what challenges we are facing and analyzing the approaches that are working. GMV has joined the cybersecurity leaders’ meeting which has involved international speakers to share their experiences, successes and risks in this digital environment with a panorama of threats that change continuously. In addition, the idea of the community-centered event, under the Chatman House rule (with the aim of providing anonymity to speakers and encouraging the exchange of information), has facilitated communication to discuss key issues such as strategies for addressing GDPR (General Data ProtectionRegulation) and global privacy regulations, or ideas related to how CISOs are creating new functions and standards in the era of Digital Transformation, encompassing disruptive technologies, change management and an investment strategy in Cybersecurity. “It is a very different event, the way it is organized facilitates the exchange of information in a circle of confidence where CISOs from different sectors and continents expose their problems and share strategic visions,” says Sonia Morales Robles, Head of the GMV Secure e-Solutions Consulting Area Section.